(9317, T. Bone McDonald Collection, OHS). (21171.9, Minneapolis Public Library Collection, OHS). The Dust Bowl period that occurred during the drought years of the 1930s represents a remarkable era in the settlement history of the West. From a climatic perspective, the 1930s drought is still considered to be the most severe on record for many parts of the Great Plains. The dry weather began in the early 1930s and persisted through the early 1940s for some areas, with the most intense drought years occurring in 1934 and 1936. The economic, social, and environmental impacts associated with the decade-long drought event of the 1930s were staggering, but never fully documented. This event also coincided with a severe economic depression, both in the United States and worldwide, that only served to exacerbate the impacts of drought. From an environmental perspective the combination of drought, economic depression, and poor or inappropriate farming practices in the Great Plains led to one of the most serious environmental catastrophes the United States has ever experienced. From 1909 and 1929 farmers had broken out thirty-two million acres of sod in the Great Plains. Many of these farmers were recent settlers and had limited experience with the region's climate. Once the protective cover of the native grassland was destroyed, the dry conditions and high winds common to the region resulted in an increased susceptibility of the topsoil to wind erosion. As a result, dust storms raged nearly everywhere, but the most severely affected areas were in the Oklahoma (Cimarron, Texas, and Beaver counties) and Texas panhandles, western Kansas, and eastern Colorado and northeastern New Mexico. 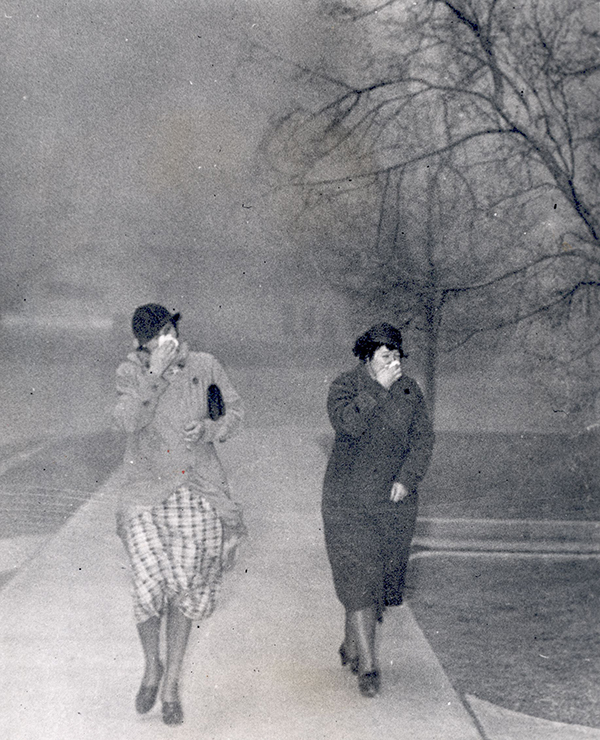 The most severe dust storms occurred between 1935 (a total of forty in that year) and 1938 (sixty-one), although numerous others were documented between 1932 and 1941. It was estimated that 300 million tons of soil were removed from the region in May 1934 and spread over large portions of the eastern United States. By 1935 an additional 850 million tons of topsoil was blowing in 101 counties of various states. 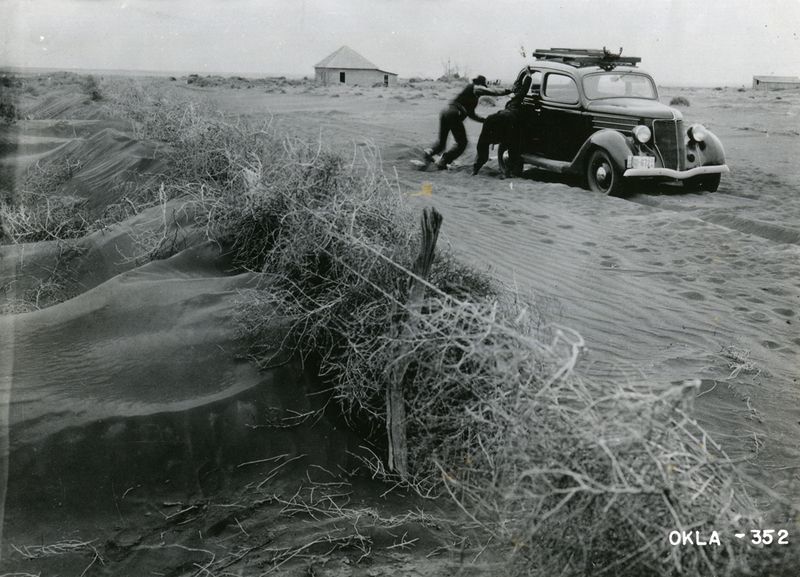 It is estimated that by 1935 wind erosion had damaged 162 million acres over 80 percent of the High Plains. Interestingly, the peak year for wind erosion occurred in 1938, not the most severe drought year, climatically speaking. By this time 5 inches of topsoil had been lost over an area of 10 million acres and 2.5 inches had been lost over another 13.5 million acres. Elizabeth Brooks and Jacque Emel, "The Llano Estacado of the American Southern High Plains," in Regions at Risk: Comparisons of Threatened Environments, ed. Jeanne X. Kasperson, Roger E. Kasperson, and B. L. Turner II (Tokyo-New York-Paris: United Nations University Press, 1995). R. Douglas Hurt, The Dust Bowl: An Agricultural and Social History (Chicago: Nelson-Hall, 1981). Vance Johnson, Heaven's Tableland: The Dust Bowl Story (New York: Farrar, Straus, 1947). Alvin O. Turner, ed., Letters from the Dust Bowl (Norman: University of Oklahoma Press, 2001). Donald A. Wilhite, "Dust Bowl," The Encyclopedia of Oklahoma History and Culture, https://www.okhistory.org/publications/enc/entry.php?entry=DU011.